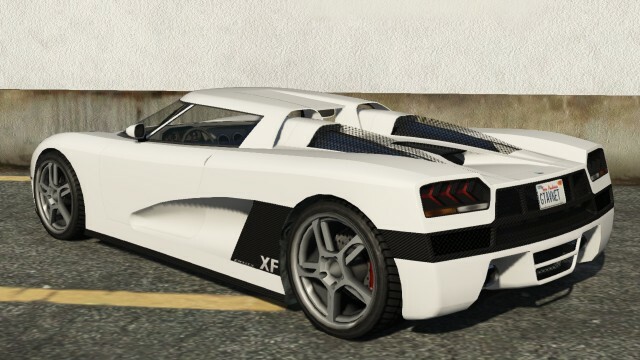 The Overflod Entity XF is a 2-door supercar featured in GTA 5. 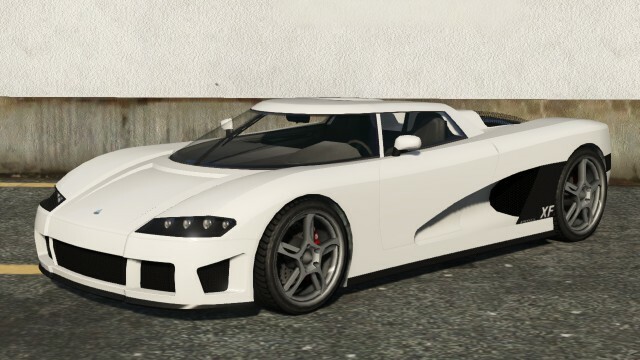 Car design seems to be heavily influenced by the style of the Swedish Koenigsegg CC8S. The logo on the bonnet / hood is similar to that of the Maserati with white and blue details and has the size and shape of the Koenigsegg. The taillamps are almost identical with those of the Koenigsegg Agera, the taillamps also identical to the Lamborghini Aventador.The rear hood of the vehicle is adopted from the Porsche Carrera GT. Entities XF‘s front end has a fairly simple styling. The front bumper is elevated to the both sides of the central area. CFRP has a small bumper splitter at the bottom. This bumper has three front channels inset in the bumper, the center channel includes two-thirds of the width of the car. As inspiration, this car has a great line on the side of the front bumper. Lamp unit has a number of lines parallel to the edge of the car body and has four points, circular lights. Car bonnet / hood has two levels of impressions, which first created the central area that runs from the base of the windshield to the bottom of the front bumper. The second level of impression contoured base to the windshield and side boundaries of the central region. The Entities XFis capable of reaching a very high top speed of 240 kilometers per hour, allowing you to fight Zentorno speeds, Turismo R, Viper, and Cheetah. It is able to burn off excess fuel from the exhaust pipe, similar to cars like the Buffalo, Infernus, Banshee , F620 and other cars like the Sultan when modified. It’s acceleration is better than that of the snake. It also has very high tensile, due to its AWD system. It is not yet known whether there is a spawning site Overflod Entity XF in the Los Santos. 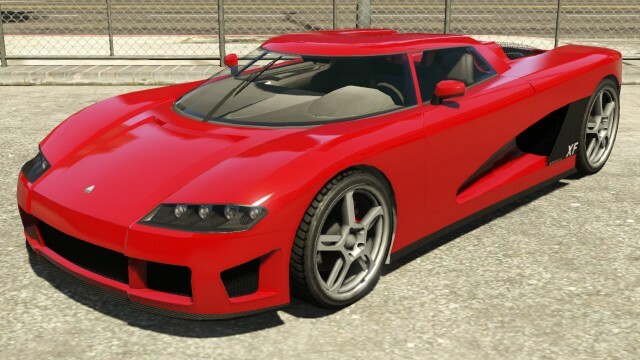 Also unknown is whether this is a part of any side mission, or special mission, or the only way to get this is to buy car for $795,000 in gta 5 from internet www.legendarymotorsport.net website. It Can be obtained by failing I Fought the Law. by killing Sebastian.